Loved this little house! Its very cozy and clean. It had all the kitchen supplies we needed for our stay, we even used the grill outside. The beds were very comfortable too. Only a short drive to the pier, cannery row and the downtown area. We would definitly stay again. This 3-bedroom, 2-bath home in a residential area of upper Seaside is perfect for a longer stay. The main living areas – with panoramic ocean views - are on the upper level, along with the master bedroom and a full bath. Downstairs, two guestrooms (one Queen and one twin trundle) share a second bath (also with a tub/shower). Beautiful ocean views from the upper level living areas and the master bedroom balcony. Lower level patio has a wood burning fire pit. South-facing balcony off the master bedroom will be one of your favorite spots. Relax in the sunshine, or under the arbor in the backyard. Compact kitchen and breakfast bar. Dining table and breakfast bar on the upper level. Master bedroom upstairs has an ocean view balcony. Upper level bathroom has a tub/shower. Second guestroom downstairs has a Queen bed and access to the backyard. Third guestroom downstairs has a wicker trundle bed. Lower level bath has a tub/shower. Laundry is in the hallway on the lower level. Entry is on lower level. Living areas and the master bedroom are on the upper level, along with a full bath. Our home away from home had everything we could have possibly needed as well as being aesthetically pleasing! The home is tastefully decorated. The bath towels were plentiful, soft, plush, luxurious. The kitchen had many gadgets to make life easier as well as spices, oils, paper towels and more. We loved being able to enter via the garage so we could leave our gear (hikers) there versus tracking things into the house (in the garage are beach chairs and other stuff as well if one needed). The views of the sunset each night were a treat from both decks and even the kitchen window. The beds were comfortable, lots of extra blankets and pillows. Truly a home with many added touches like shampoo, conditioner, body wash, huge closet space, snack bars and oatmeal, a homeowner's sign-in book to share our experience with them as well. We were convenient to the freeway and fortunately we could use a few back roads to avoid some of the commuter traffic, a nice convenience. In short, luxurious, convenient, relaxing and pleasurable. This place was perfect for our trip. It is less than 15 minutes from Pebble Beach, Fisherman's Wharf, Carmel, and other locations. The house was comfortable for 5 people, nicely decorated and we had no issues at all. We would definitely stay there again if the opportunity comes up. Rental was really clean and nice. It had everything you need for the beach and games and toys. We would definitely visit again! What an awesome week! Hilltop Haven was spotless, very well stocked, and comfortable. Great views, easy to live in, garage is filled with items to use at the beach or in the backyard. We can’t wait to return. Book it! Our group of four really enjoyed our stay here in Seaside. The condition of the home was excellent and well stocked. Location was good for our activities. Everything was very easy - from picking up the keys to dropping them off. Highly recommend this property and would definitely stay here again. This was a great fit for my family of 4 (2 adults, 1 kid and 1 baby). The kids each had their own room downstairs and the master is upstairs, which was great after the kids went to bed. There was plenty of room in a downstairs bedroom for us to set up our portable crib. The beds were all very comfortable (coming from Tempurpedic owners!) and the place was well equipped with all the kitchen and bathroom items needed. We loved the recliner couches, so much so that my husband is looking into getting us one at home! We were provided a detailed and very helpful email with directions and instructions, so check in/out was a no-brainer. This gem is only a few miles from the Aquarium and we plan to try to stay again on future Monterey trips! Excellent place. Looked just like the pictures. Was plenty of space for our group of six. Could see the ocean from the living room. This place was great for our stay! We are a family of 5, all grown adults. We took advantage of the fireplace inside, the balconies, and the fire pit outside. The location is very close to town - about a 5 to 6 minute drive to the Wharf and Cannery Row. The kitchen was very well stocked and we cooked 2 of the 4 nights we were there. The ONLY thing we didn't care for was the sloping driveway (there is a garage you can park in but we were driving a huge suburban) and the bathroom counters were small so I couldn't spread my makeup/overnight bag out on the counter. Other than that, a wonderful stay at a wonderful property!! This home is just lovely. It is equipped with absolutely everything you will need for a wonderful stay. I stayed over Christmas and brought everything I thought I would need to prepare a complete holiday meal. I found that everything but the potato masher was already there. the place is beautifully decorated and very clean. My family and friends had a wonderful time. This Hilltop Haven was indeed perfect. It was beautifully appointed with a great floor plan. We were close to Monterey, 17 mile drive & grocery stores. Loved the garage, very comfortable beds, barbeque worked well with an extra propane tank and the neighborhood was quiet. The kitchen had every thing we needed to cook all our meals. Each room had a flat screen TV. There was a bulletin board with area maps which helped us select our outings. We used the backyard but could not get the log to ignite. My family and I stayed here during a family wedding weekend for my cousin. We were six adults and a baby and it was a perfect amount of space and definitely enough room! We loved the open kitchen and living area, as well as the two different porches. The Keurig was also a nice unexpected touch. The place was very clean and there were plenty of extra linens and towels. The staff was super helpful on the phone and in-person when picking up and dropping off the keys. Overall, great experience at a great value! Definitely would recommend and stay again. 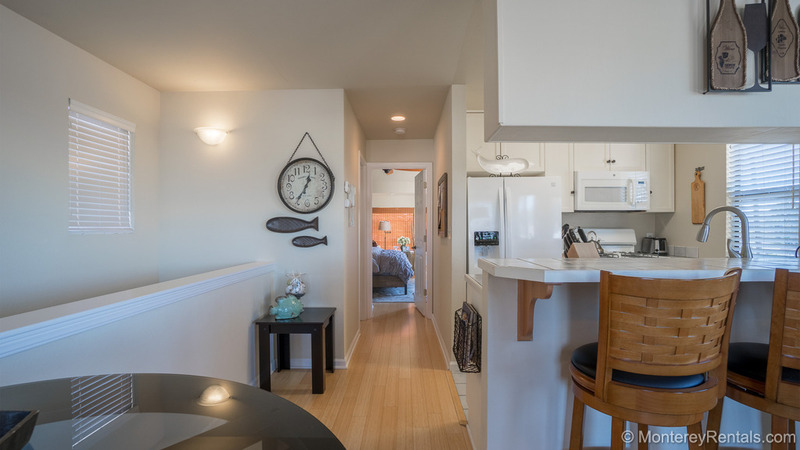 Charming, cute, updated, clean rental property. Kitchen was beyond well equipped . 5 burner newer gas barbeque was great, used both nights. Six lady golfers stayed 2 days. Home is close to freeway access and main Monterey attractions. Great place for 6 people, king, queen, and 2 twins all had comfortable beds. We look forward to coming back, great property. Everything was perfect. Great place to stay with two families and kids. Thank you! Hilltop Haven was the perfect home for my family and I as we spent a couple weeks traveling up and down the coast of California. It was spacious, modern, and extremely clean. It is close to many attractions as well as local food places. I would recommend this place to any family wanting to see the beautiful city of Monterey! Beautiful home! The attention to every little detail was evident and very much appreciated. Thank you! Beautiful Home. Plenty of room for a group or family of 6/7. Neat and very clean. Walking distance to local stores and restaurants. Would like to return again. The Hilltop Haven is very comfortable and was what we expected based on the description with one exception. The site says it has a grill and when we were there, there was no grill on the premises. It has a bay view from the balcony off the master bedroom. We only used one bedroom, but the bed, pillows and linens in that room were great. The kitchen had every thing I needed We were quite satisfied with it. We did find the key return process inconvenient. The rental office is 15 minutes from the house so we lost a half hour at our departure because we had to go to the office to return the key, and then go right back the way we came. The barbecue grill is located on the small deck off the living room. We're so sorry you didn't see it, and wish you had called our 24 hour line so we could have let you know the location. We do apologize for the extra time it took to return your keys (we are currently researching automated lock solutions).